The Fielding Estate Winery is a family winery founded by Ken and Marg Fielding. 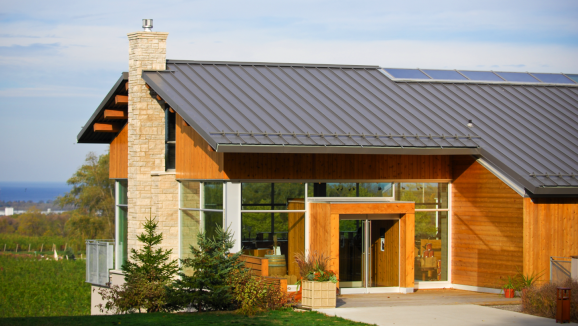 The winery is distinguished by its modern winemaking facility situated on the Niagara's Beamsville Bench and award winning wines to present to its customers. The Fielding Estate Winery gives importance to varieties that deliver the best. The Fielding Estate's small lot wines are developed from fruit that have harvested from their vineyards. Come to Fielding Winery's Wine Lodge during winter to enjoy great wine as well as a nice view of Lake Ontario and of the vineyards themselves. The Fielding Estate lodge has been developed from cedar, glass and stone and is an ideal show of homage to Northern Ontario's cottage country. You can sample three choice VQA wines in the process. Cabernet Sauvignon, Merlot, Pinot Noir are some of our popular wines here. Some other kinds of Fielding wine available at Fielding Estate Winery are 2007 Syrah, 2010 Estate Bottled Pinot Gris and 2009 Red Conception. Summer, May-Oct. 10:30 a.m.-6 p.m.
Fall, Nov.-Apr. 10:30 a.m.-5:30 p.m.
10:30 a.m., 1:30 p.m. and 3:30 p.m.
Fall, public tours by appointment. Year-round, private tours by appointment.